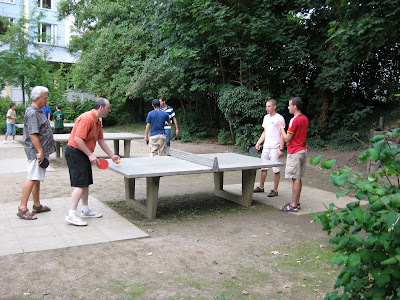 A table tennis interlude provides a nice break from the intensity of the sessions of CHARIS, the worldwide gathering of Grace Brethren church leaders, meeting at a youth hostel in Bad Homburg, a suburb of Frankfurt, Germany, this week. CHARIS officially ends with a Friday evening session. Playing table tennis here are, from left, Steve Bailey of Argentina, Nathan Bryant of Canada, Jordan Varak of France, and Mike Yoder of Germany.